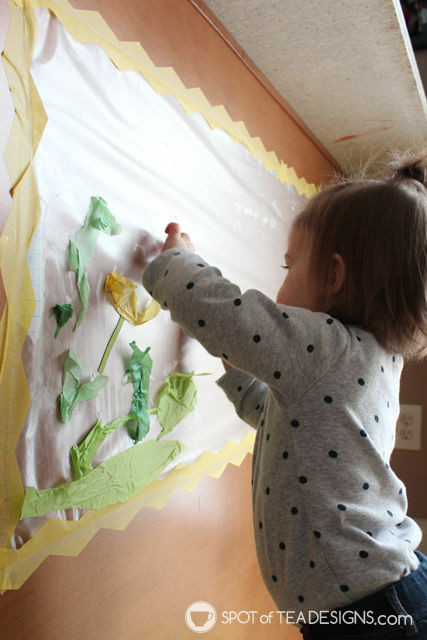 Brielle loved our first attempt at contact paper play back when we made fall leaf sun catchers with her cousins. 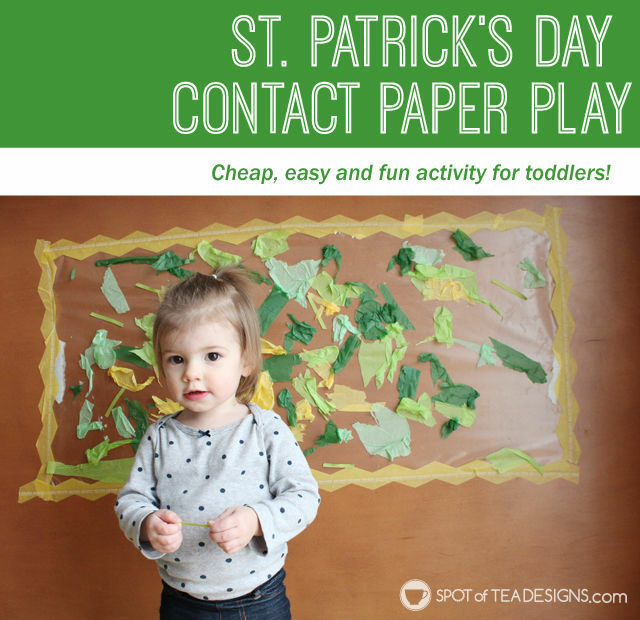 But it’s been a while since we played with that fun material and it was time for a new activity for St. Patrick’s Day! I cut a large sheet of the contact paper, peeled the adhesive backing to expose the sticky side and used a decorative painter’s tape I had on hand to attach it sticky side out on our wall. Next, I let Brielle play! 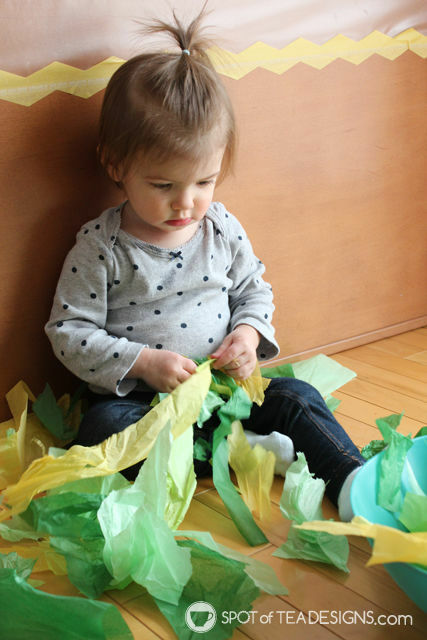 Previously I had tore up the tissue paper into tiny pieces, but this time I only did so in big chunks, encouraging her to tear it up into smaller pieces on her own. A great fine motor activity! 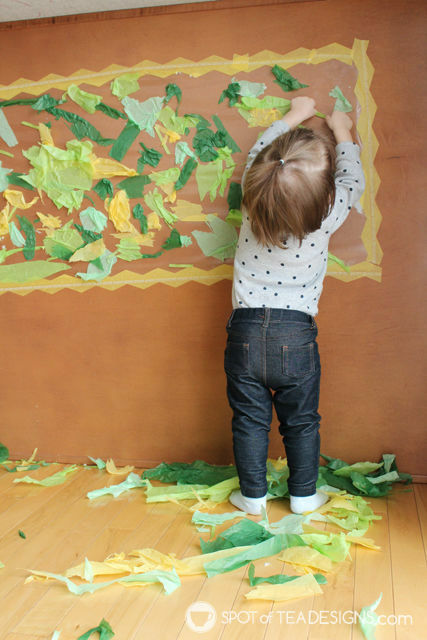 After showing her how you can tear a piece and stick it on the contact paper, she got the hang of it, placing her pieces on the sticky wall and making her St. Patrick’s Day themed art! 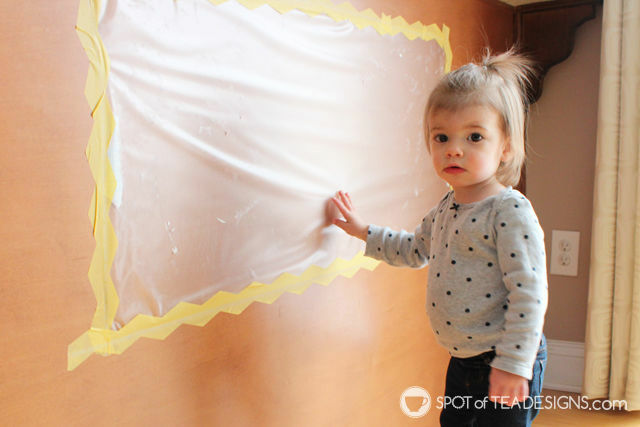 We left the sticky wall up for a few days and occasionally I’d see her go back and add some pieces, tear something off or just go and “tap tap tap” the vacant sticky areas. She loved placing those ribbon pieces best! 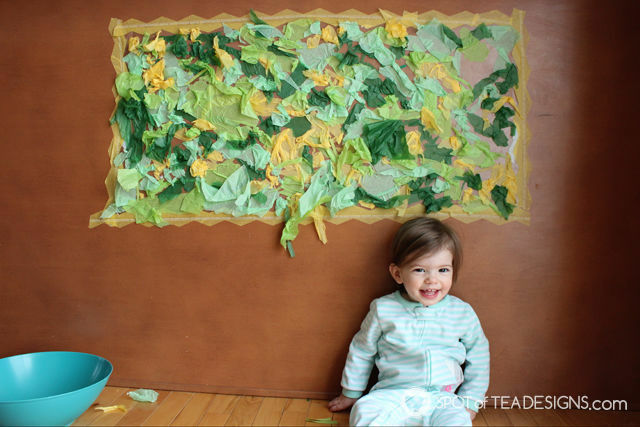 Eventually it was all covered with tissue paper and ribbon strips and looks like the above piece of St. Patrick’s Day art! 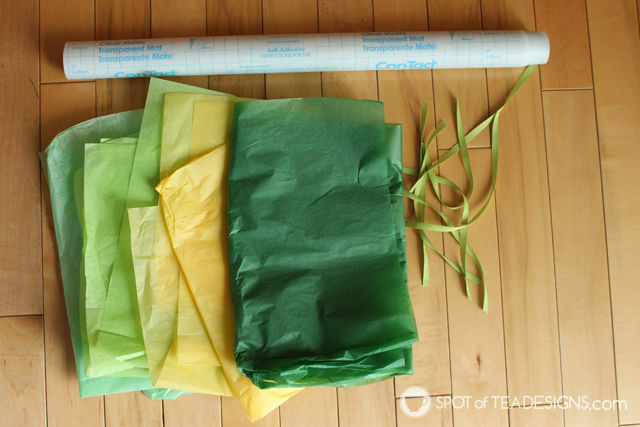 And if you’re looking for a fun project for toddlers who are a little older than miss Brielle, or for preschoolers learning colors, check out my St. Patrick’s Day Rainbow Kids Crafts complete with the free printable so you can do it at home! LOVE This idea! I wish I knew about it when the kids were young. Brielle is SO cute putting up all the paper!!! I might actually do this with the kids. May need to do separate ones because of all the fighting recently :) Thanks for such a cute idea!! Yay! Glad I inspired you! Would love to feature your version on my reader’s feature if you guys do it!